I have already written an article on a very wide-spread penetration table. Here is a table for some lesser-known guns (regrettably, missing most of the ones I was interested in). 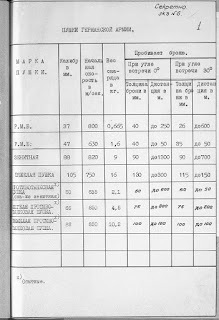 This document shows the penetrations of some pre-war guns, and their caliber, muzzle velocity, and shell weight. 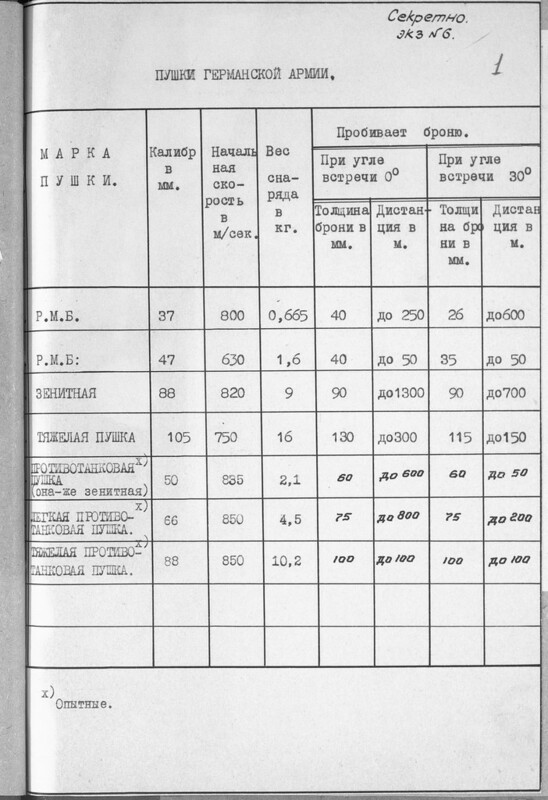 This table lists some guns we're seen before (ZiS-4, 45 mm tank gun, F-34), but some new ones. There is the DShK, whose practical penetration I covered here. The table gives it 25 mm at 0 degrees and 200 meters, and 10 mm at 30 degrees at the same distance. This seems pretty fair when compared to those tests. Another interesting gun is the F-30. It was tested in the T-28, and never made it into anything in mass production. 100 mm at 1000 meters at 0 degrees and 90 mm at 30 degrees is around the same as the D-5-T. A lot of the time, different guns that use the same shell do not actually possess different ballistic properties, but are instead differentiated by cost, size, ease of use, etc. We see another gun I covered next, the ZiS-6. The penetration against a 30 degree sloped plate is the same as in that document, but this document shows the penetration against a flat plate at that distance: 128 mm. The gun after that is the M-10 on the KV-2. I can't imagine that it was used very frequently with AP, given how devastating its HE shell was. There is at least one case of KV-2s using concrete-piercing shells against tanks. This gun achieves 85 mm against a sloped plate at 1000 meters, and 90 against an unsloped plate. This is worse than the ML-20 152 mm gun in the other penetration table, which is expected, given the M-10's shorter barrel length. Now we get into something really interesting: foreign guns. Since there was not yet a chance to discover the penetration of German guns firsthand, these are based on data from military intelligence. Let's take a look. Keep in mind that a) this data is from gathered intelligence and is bound to be approximate, especially considering that b) the Germans tested to a 50% penetration standard, and the Soviets to a 75% penetration standard. The first entry is "Rheinmetall Borsig" 37 mm. The shell mass is reported as 0.665 kg, at 800 m/s. This penetrates 40 mm at 250 meters and 26 mm sloped at 30 degrees at 600 meters. The Germans' own data shows the 3.7 cm PaK 36 as having 31 mm sloped at 30 degrees of penetration at 500 meters. Projectile weight and muzzle velocity are pretty close too. The next gun is "Rheinmetall Borsig" 47 mm. I have no idea what this is supposed to be, but it doesn't penetrate very well, and this is at very close distances. Next is an 88 mm AA gun. Apparently it shoots a 9 kg shell at 820 m/s, which is a little too light and a little too fast, but the penetration numbers given seem consistent with that other penetration table data. The next gun is a new one, "heavy gun", 105 mm, maybe a 10.5 cm FlaK gun. The one after is an "anti tank (and also AA) gun, exactly matching a 5.0 cm PaK 38. After that, we see something interesting: a 66 mm light AT gun, penetrating 75 mm of armour at 800 meters, or 75 mm of sloped armour at 200 meters, firing a 4.5 kg shell at 850 meters per second. Perhaps this is data from some kind of 75 mm squeezebore gun. Or maybe a captured Czech gun? The last entry in the table is an 88 mm AT gun, which, for some reason fires a different shell at a different velocity than the 88 mm AA gun, and also penetrates the same amount of armour at 100 meters, angled or not. 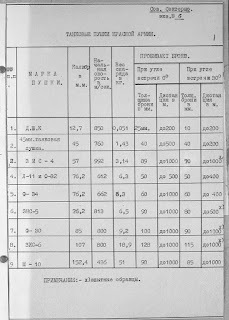 "The last entry in the table is an 88 mm AT gun, which, for some reason fires a different shell at a different velocity than the 88 mm AA gun"
AFAIK 88 mm FlaK 18 used PzGr (no number), while 88 mm KwK 36 used newer PzGr 39. Shell weights seem to support that, though the muzzle velocity of PzGr 39 was ~770 m/s. Also, I thought that F-34 and ZiS-5 were ballistically (nearly) identical. Any idea why ZiS-5 has that high muzzle velocity? The x) marks the ZiS-5 as experimental. I guess the experimental version was supposed to have a higher velocity, but was shortened (like with the ZiS-2 and ZiS-4). 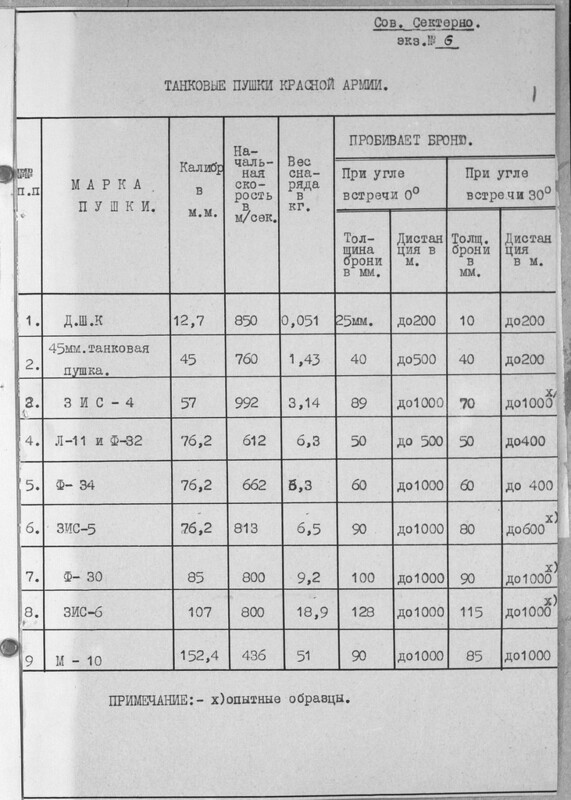 I found a document on the development of the ZiS-5, and it describes the breech being sturdier than the F-34, allowing for more propellant to be used, which would let the shell penetrate 75 mm at 1000 meters. Maybe this is a shell with more propellant. -its impossible that a gun penetrates the same amount of armor with and without 30° angle. maybe it should be 1000m for the vertical and 100m for the sloped plate, that could make sense but still unsure about it. -The German testing methodology relied on measuring the distance traveled through the plate, not the thickness of the plate. The angling was to makes sure the shell can deal with sloped armour without falling apart. This is not correct, Mr. Samsonov. German proof service acceptance test for lots of AP projectiles specified a definitive armour plate thickness -not line of sight- and quality of armour plate and the 5 out of 5 successful, complete and intact penetrations in a row against RHA set up 30° from the perpendicular. a sixth projectile was fired to determine how good (or bad) the lot was, depending on the authority of the prooving ground personal. Actual penetration from WaPrüf tests with stock ammunition (five successful perforations in a row, no failures) was slightly higher (203mm for the KWK43, 147mm for the KWK 42, 107mm for the 7.62cm(r)) but close to the acceptance limits and a single failure (one out of five) caused the lot to be retested, and if another failure occurs in retests, or if two or more failures occurred during initial proof trial, the submitted lot was declared unfit for stock and had to be rejected altogether, all prepared shell bodies from this heat to be discarded. From mid44 attempts were made to raise the service acceptance specification from 30° to 45°, but it remains unclear, whether or not this was ever executed. There is some evidence to suggest that Bochumer Verein in 1945 tested against 45°. its five successfully penetrations in a row, where sucessfully penetrations in a row has a definition on its own. But yea, the angle was there to make sure how good the shell is able to deal with sloped armor. im sorry, been a little hasty .. The 66mm is probably the 6.6cm Pak 5/800, an experimental skoda design. I've only seen one reference to it, which quoted a 5kg shell at 800 m/s, but this might be a different loading. It was experimental after all; only one was made. For the 47mm, it might be a RB round for the Pak 46(t), a captured 47mm skoda AT gun that the Germans used, including mounting them on Pz I for AT use. The shot weight is about right but the velocity seems a little low. The velocity is about right, but the shell weight is wrong for the Italian 47mm gun. Overall it seems much more likely that the Germans manufactured ammunition for the Skoda piece than the Italian one. For the 105mm, the velocity seems low for the 105mm Flak 40. It might be for the schwere 10cm K18 field gun, also made by RB. AFAIK The Germans did NOT test 50% penetration, the only possible reason for this, well perhaps it is or is not a - myth, is that I have read that at farther distances such as 1km+ Germans would generally allow more tolerance to consider it a successful penetration. And like the guy said above: NO gun can have identical penetration on both flat and angled armor. The 10.5cm "heavy" that you refer to may indeed by the experimental sabot design that the German's worked with. They had developed a sabot round for a 10.5cm FlaK gun that was to replace the 8.8cm KwK 43/L71, however the projectile was to be made of tungsten. Tungsten was in short supply so the project was abandoned. In reading the first part of your blog/post with the testing tables, you might also consider the following factors. 1) Mid-war the Germans were forced to change the metallurgical composition of their APCBC, and APCR rounds. The Pzgr. 39 was actually a APCBC-HE round, most people fail to realize that. The Pzgr.40 was a true APCR round. The composition changed in 43 from chromium-nickel-molybdenum to silicon-manganese. They initially tried to harden the new APCR rounds to the same hardness as the previous C-N-M rounds, but discovered that the rounds suffered failure due to the shatter-gap phenomenon that many allied APCR rounds experienced--they were to brittle. So the Germans changed the design from one of high hardness at the nose (but lower density) to higher toughness at the tail (higher density) and lengthened the penetrator a bit. The new APCR rounds were much more effective. If the tests were done based on captured early '43 ammo, that would explain the failures and low armor penetration. Jentz and Norris, both of who have developed extensive penetration tables for all German tank guns both agree that the 88mm KwK 43/L71 was capable of penetrating 203mm @ 100m (Jentz 1996 and Norris, 2002) and both discuss the temporary decline in penetration due to the metallurgic changes. The existence of a small filler ("Zerleger") in Pgr.39 doesn´t qualify for the term APCBC-HE. The filler had no explosive blast effect, and wasn´t intended to create one in the first place. It was there to fragment the projectile after penetration to prevent cases of overpenetration from side to side. The APCBC-HE existed though, it was the older Pgr. rot with a larger HE filler for blast effect. the changes of the armour piercing projectiles 1941-42 are more complicated than described here. They re-engineered virtually everything. The basic steel mix, the hardening pattern -nose to base (initially with welded on nosetips), they reduced the nose curvature for better medium obliquity performance and they reduced the internal cavity significantly for a more robust penetrator. These measured allowed these improved projectiles to stay intact and not suffer bending up to ca. 1260m/s striking velocity against RHA more than 3 times their calibre within 0° to 30° and later to 45°. Staying intact in the first place allowed for more penetration by increased impact velocity, a significant problem with the older projectiles.